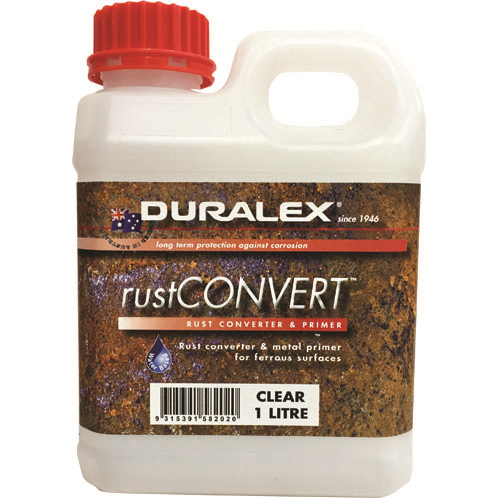 Duralex rustCONVERT™ rust converter, primer, sealer is a 3in1 treatment for ferrous metal surfaces. It is a unique polymer coating that chemically converts heavy and flaking prepared rust to a stable black sound surface that is ready to apply Duralex primers and paints. Duralex rustCONVERT™ is ideal for the treatment and preparation of heavy and flaking rust on steel structures including trailer body and chassis, building frames, roof, gutters, sheds, balustrades, wrought iron and fencing, etc. Milky appearance which dries clear. Sizes 250mL, 500mL, 1 Litre, 5 Litre and 10 Litre. Coverage Up to 12-14m² per Litre per coat.